According to Yelp, there are 555 donut-serving establishments in the city and east bay. And while an unknown number are cafes, coffeeshops and Chinese cafeterias, it’s obvious the Bay Area is not lacking in sugary fried dough substances. Some are good, some suspect, but generally we do a passable donut product here (not like the sad state of our bagels and pizza*). I thought it was pretty much like that, until I came across a thing so rare I was unaware it actually existed until sinking my teeth into its still warm, perfectly textured (not too dense, not too fluffy), generously iced dough, and was transported to a land of rainbows and unicorns and dancing Homers. And I’m not even a big donut fan. The glazed are the flagship item here, and often sell out, requiring a separate line of their own. (That’s right, people stand in one line to order, then a second line to wait for their glazed. Special.) But you can’t go wrong with the cinnamon twist, old fashioned, jellied, powdered, sprinkled, mapled, or whatever they have winking from the display case. It’s all fresh, moves quickly, and usually everything sells out before they close their doors at 3pm. There’s a bonus to waiting in line: You get to breath in the aroma and the ambiance of a donut shop the way it looked in the 1950s: The place has barely changed since its opening in 1959. It’s like a museum, from the plastic Pepsi menu board with letters you have to slot in place, to the big tub of a deep fryer that’s seen better days. 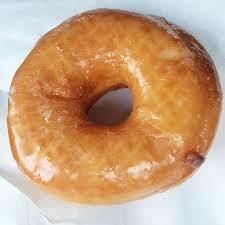 And best of all, Stan’s donuts are low in calories…. um, seriously, they’re donuts. *But what about Flour + Water and Delfina you ask? Yes, both good, but I’ve had comparable pizza in places like Miami that didn’t have a two-hour line to get a table and weren’t on any ‘best pizza’ lists. Why? Because making good pizza in other places is standard, where here it seems to be this fabulously complicated process that only a lucky, talented few have figured out. I don’t know, maybe it’s the water, or the Mediterranean climate… wait, Italy has the same climate. Anyway, the very non-foodie city of Miami has a handful of these places that no one thinks twice about. Now, don’t even talk to me about bagels.